EMALAHLENI, South Africa – Not far from Johannesburg, set amid the corn and sunflower fields of the Highveld in Mpumalanga province, stand two unusually thick and tall candy-striped smokestacks, dozens of stout concrete support columns, and the tangled steel superstructure of the unfinished 4,800-megawatt Kusile coal-fired power station. About 370 kilometers (230 miles) northwest, spread across a stretch of dry scrubland in Limpopo province, is the construction site for Kusile’s unfinished twin, the 4,800-megawatt Medupi power station. 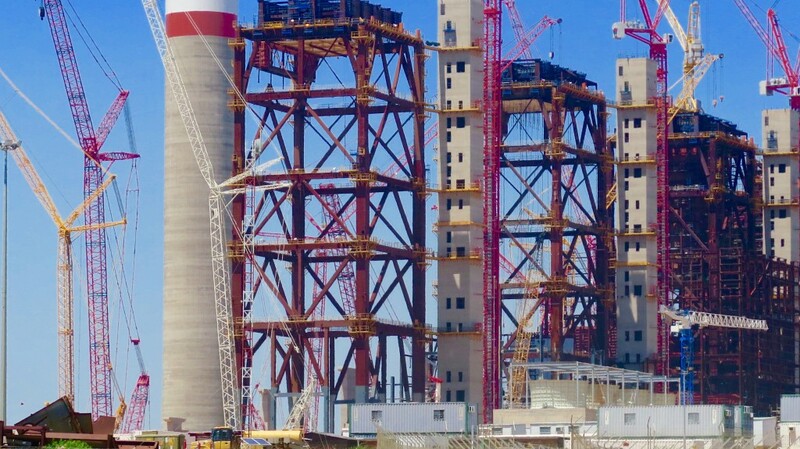 More than a decade ago, at the turn of the 21st century, South Africa conceived the idea of building Kusile and Medupi, two of the four largest coal plants in the world. The proposal gained significant public prominence around the century’s end when South Africa’s bid to develop its own nuclear reactor design, and build several plants, was rejected by the global finance community. Medupi and Kusile, designed with advanced water conservation cooling and pollution control systems, and due to be completed by 2014 and 2015, respectively, at a cost of $US 6 billion each, were greeted as both momentous and logical. For over a century South Africa’s economy fueled itself with the nation’s ample coal reserves, which today generate 90 percent of the nation’s electricity and 35 percent of its liquid fuel, employ tens of thousands of workers, and consume two percent of the water. Over the last several years, dawn has evolved into a gathering storm. Long construction delays and escalating costs, engineering challenges, and the intensifying risk of scarce water have pushed Kusile and its sister plant into the eye of a typhoon of economic, ecological, and social disturbances engulfing South Africa. In so many ways, the troubled development of Kusile and Medupi, and the tumult enveloping South Africa’s deteriorating financial and social condition, are not just mirror images of each other. The two plants, projected to be almost a decade late in completion and $US 20 billion or more over budget, are among the principal causes. The trouble is not simply a matter of managerial missteps. The vortex of disruption that envelops Medupi and Kusile reflects the clash between the economic and ecological operating systems of two centuries. Kusile and Medupi arguably represent the most prominent global examples of big projects that do not fit their time. Conceived in the resource-rich, more ecologically stable, and capital-abundant turn of the century, the two plants were viewed as reasoned answers to South Africa’s growing demand for electricity, and as evidence of a new government’s capacity to execute complex industrial projects. South Africa sees its global reputation as tied to completing the two plants. “They must finish and they will finish,” said Jacob Misimango, a 54-year-old business executive in Emalahleni who is seeking permits to start an open cast coal mine outside the city, in part to supply fuel for Kusile. “These projects have drawn the world’s attention. They have to finish. Why? “Number one. There is a shortage of electricity. The only solution is these stations. We have coal to fuel them. “Two. It’s important for our government to prove we can do this thing. Our national pride is at stake. Not being able to finish is demoralizing. We must prove we can finish. But well over a decade after they were initially proposed, both plants, and their builder, are crashing into the project-debilitating limits of the resource-scarce, ecologically unstable, and nervous financial markets of the advancing 21st century. Said another way, the narrative of economic progress, expressed by gargantuan industrial projects and centralized management practices, is breaking apart under intense ecological pressure. Taking its place are two new stories. The first documents the advent of new energy generating technologies – solar, wind, and small hydropower plants – that are less expensive, consume smaller amounts of critical resources, especially water, and take a year or two instead of a decade to build. From 2010 to 2015, South Africa brought 1,900 megawatts of renewable energy online – most of it wind and solar generated – at an average cost of around $US 1.5 million per megawatt. Wind and solar generating stations, according to the South Africa Department of Energy, now add roughly 1,000 megawatts of new generating capacity annually to the national grid, take up less space and cause much less damage to the land than coal mines, and use scant amounts of water. 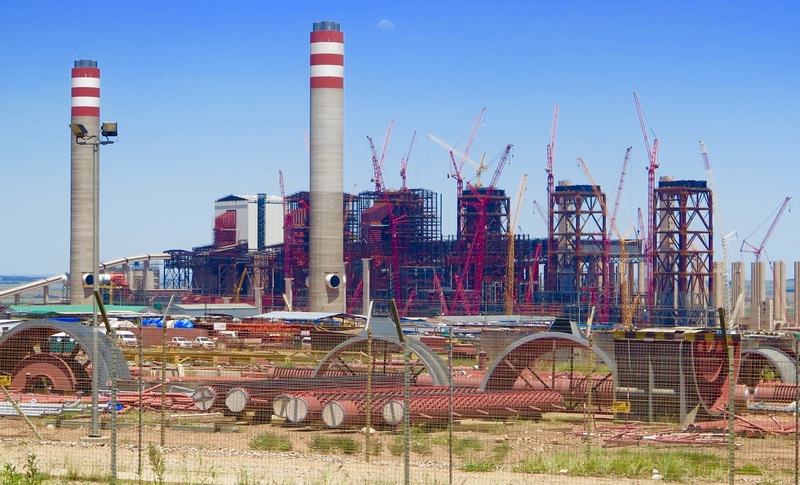 The new plants also take 15 months to two years to complete, says a Department of Energy report made public late last year, and produce power at about half the current estimate of the cost of electricity that will be generated by Medupi and Kusile.